Wondering what halloween promos to use in your next campaign? Check this blog post out and see how one of the best lager companies in the world has used excellent promotional merchandise to boost sales in such a scary season! Made out of soft PVC, the material can be shaped with any design you require and thus giving it an exclusive yet curious look to surprise your customers in bars. How has these halloween promos used by Guinness enabled them to increase sales in a yearly season event? The goal was to generate traffic to local pubs and bars on Halloween night. Due to its signature colours of black and white, the beer brand could easily pass off as a creature of the night. Following this concept, Guinness came up with a creative yet low cost gimmick. For every Guinness beer bought, a ghostly shadow shaped coasters was given. 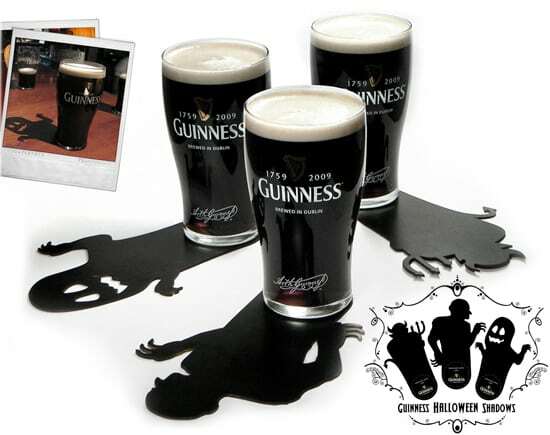 The coasters transformed the shadow of the Guinness glass into scary and fun shapes (ghost, goblins and devils). This interesting gift with purchase created buzz as people were curious about it. Patrons really enjoyed the idea and wanted to bring them home as a memento. Guinness sales boomed that night enormously and attracted new prospects. Get in touch with ODM to work out your very own seasonal novelty; promotional products work wonders in festive seasons like this. We have an in house design team, Mindsparkz, who are willing to brain storm your next marketing campaign and offer your unique items from concept to mass production.